In 1960 the Mil Design Bureau commenced to work on a project of a new multi-purpose helicopter, planned as the successor of the Mi-4. The new design was to sport turboshaft powerplant, stronger and lighter than piston engines used hitherto in the Mi-1 and the Mi-4 helicopters. The prototype, rigged with only one AI-24-type engine, first flew in June 1961. The new design featured many construction elements of the Mi-4 airframe, including a single-engine propulsion and a four-bladed main rotor. While the basic construction layout proved satisfactory, a single-engine configuration made the first Mi-8 underpowered and didn’t offer the required safety standard. Hence, a new Klimov TV2-117 powerplant was coupled to V-8A prototype, which first flew in September 1962. In October 1963 a new five-bladed rotor was positively tested. This configuration was deemed optimal and thus the design entered mass production. In 1965 the No. 387 plant in Kazan manufactured the first serial Mi-8. Five years later the Mi-8 production was also started in No. 99 plant at Ulan-Ude. The transport version was initially coded by NATO as ‘Hip-C’. Beginning with 1967, Mi-8 was being adapted for the demands of the modern battlefield. Eventually, in 1968, the Mi-8TV assault version took to the air. It was equipped with twin racks for external stores on each side, able to carry 64 x 57mm S-5 rockets in four UB-16-57 packs. The pilot’s cockpit was rigged with a simple PKI or PKV collimator gunsight. So armed variant was identified in the NATO code as ‘Hip-E’. 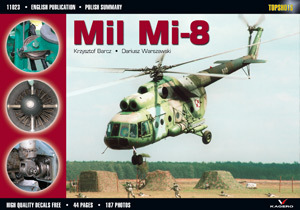 Polish combat units received their first Mi-8s in 1968. During the following years of long service, both Polish civilian and military aviation used several sub-types of the Mi-8: Mi-8T (transport), Mi-8 Salon, Mi-8P (passenger) and Mi-8TV (assault/transport). Popular and numerous, Mi-8 came to epitomize the helicopter transport. It participated in many rescue missions countering natural disasters. During each pilgrimage of the Pope John Paul II to Poland Mi-8S VIP-configured helicopters served as airborne means of transport. 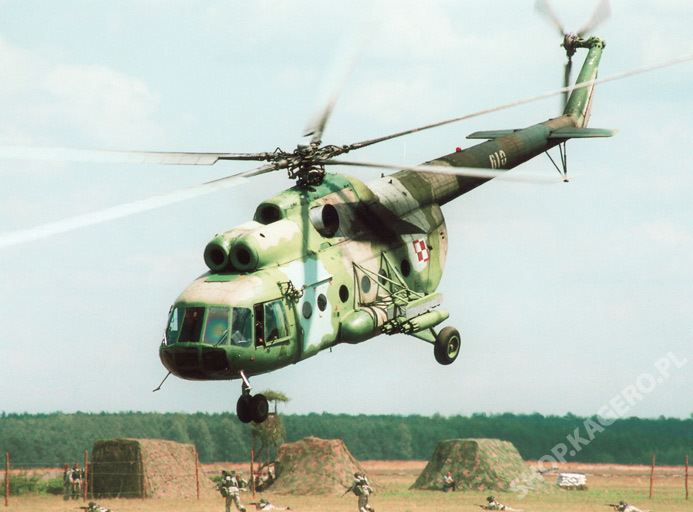 When Poland joined NATO, it created its own Air Cavalry units, which made good use of the Mi-8 as a fast and highly mobile means of transport for infantry squads and light artillery equipment. Overhauls and occasional upgrades, which allow the Polish Mi-8s to remain competitive and effective on a modern battlefield, are carried out by the Lodz Military Maintenance Works No. 1. There, Mi-8 underwent upgrades to enter service with a combat SAR (Search and Rescue) unit as Mi-8RL, specialized in rescuing MIA airmen (creation of such a unit was one of the Polish obligations associated with joining NATO). The Mi-8 became a first-rate export ‘hit’ of the Russian aviation industry. It proved its worth in over 100 recipient countries all over the world and in every climate. Its present operators still want to overhaul and upgrade their Mi-8 fleets to make them meet the demands of the modern combat, as well as civilian air transport.